The 142,000 species of moths worldwide range in appearance from large and colorful to small and dull. You often see moths at night circling your back porch light. If you are one of the unlucky ones who have moths inside your home, you may see their damage in your closet, since they can tear through clothes and fabric. When the female is ready to mate, she releases air-borne chemicals called pheromones from a gland close to her abdomen. 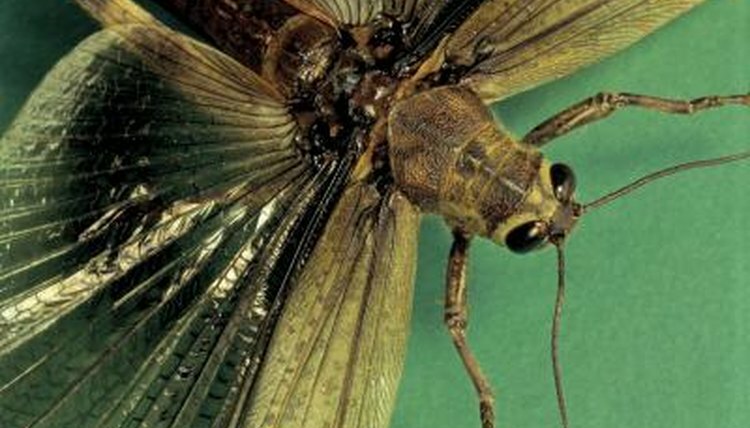 The male receives them through his antenna, according to the Encyclopedia Smithsonian website. The pheromones have an odor that informs male moths that the female is ready. The scent is species-specific and is rarely confused by other male moths outside of the female’s species. Various species of moths mate during different times of the year. Moths, however, need warm weather to fly and generally mate only when the temperature is over 77 degrees Fahrenheit. After the female attracts the male with her pheromones, the male attaches to the female and fertilizes the eggs internally. Some species of moths mate after a dance or rigorous battle, while others are docile maters. Female moths carry the eggs inside their bodies and search for a place to lay them soon after mating. Some species may have 100 or more eggs at a time, while others may only have a few. Generally the female deposits the eggs in a location where the newly hatched larvae will have plenty of food, generally around plants or leaves. Often, the eggs lay dormant until the weather is warm enough for the young to thrive. After the eggs hatch, the new larvae are known as caterpillars. During this stage, they live in and feed off the land. They burrow deep in the ground during the winter months and emerge in the spring, often feeding on vegetation and crops, such as tobacco, often causing farmers strife. After this stage, the winged creature everyone recognizes as a moth, with its long, segmented abdomen, antenna and wings, emerges. Adult moths generally live from a few days to nine months or longer, depending on the species. Butterflies and Moths: How Long do Butterflies and Moths Live? The Children’s Butterfly Site: How to Butterflies Mate?